Scott Pruitt, the embattled head of the Environmental Protection Agency who was under multiple ethics investigations, has resigned, the latest top official to leave the Trump administration. "I have accepted the resignation of Scott Pruitt as the Administrator of the Environmental Protection Agency," President Donald Trump tweeted Thursday. As of Monday, Pruitt will be replaced by deputy EPA administrator Andrew Wheeler, who will take over as acting head of the agency, Trump tweeted. The president added that he thought Pruitt had "done an outstanding job" and that he would "always be thankful to him." While Pruitt earned high marks from Trump for efforts to roll back environmental regulations, among them programs begun by President Barack Obama, questions about the administrator's ethical behavior became a frequent distraction. Opponents criticized his lavish travel arrangements, his unusual arrangement renting a room in a lobbyist’s wife condo, his costly personal security demands, reports that he tried to use his position to get a Chick-fil-A franchise for his wife and his attempt to buy a used mattress from Trump International Hotel. ...on Monday assume duties as the acting Administrator of the EPA. I have no doubt that Andy will continue on with our great and lasting EPA agenda. We have made tremendous progress and the future of the EPA is very bright! The EPA's inspector general, the Government Accountability Office and the White House were investigating allegations concerning Pruitt's spending on first-class travel and security, his dealings with subordinates and with lobbyists, and other matters. Trump had repeatedly defended Pruitt and the work he was doing at the EPA though that support appeared to be wavering. Hogan Gidley, White House spokesman, said on Tuesday that the reports about Pruitt were "something we're taking a look at." Even some conservatives had begun calling for Pruitt's ouster. Television and radio host Laura Ingraham tweeted of the administrator on Tuesday: "Pruitt is the swamp. Drain it." Other top administration officials who stepped down or were fired include Michael Flynn and H.R. McMaster, national security advisors; David Shulkin, secretary of veteran affairs; Tom Price, secretary of health and human services; Rex Tillerson, secretary of state; and Gary Cohn, the chief economic advisor. Earlier on Thursday, The New York Times had written that Pruitt was facing questions about whether his aides had deleted sensitive information from his public schedule, possibly in violation of the law. A senior scheduler was fired after she refused to alter the administrator's calendar, the Times wrote. On Monday, as he was eating lunch at a Washington, D.C., restaurant, a teacher named Kristin Mink stopped by his table holding her 2-year-old to urge him to resign because of what he was doing to the environment. Video of the encounter went viral. A woman carrying her son confronted Scott Pruitt, the head of the EPA, at a Washington, D.C. restaurant and urged him to resign "before your scandals push you out." Reaction was swift from Pruitt's critics. Citizens for Responsibility and Ethics in Washington had a one-word response: "Good." Vermont's independent Sen. Bernie Sanders tweeted, "I will do everything possible to see that the next EPA administrator actually believes in environmental protection." In recent months, amid unending barrages of ethics complaints and federal inquiries, Pruitt's was losing staff members. Last month, he announced the resignation of his senior legal counsel, the second departure of a top aide in as many days and one of a half-dozen since April. The counsel, Sarah Greenwalt, was due to appear for questioning by a panel of House Oversight committee staffers investigating allegations of ethics violations against Pruitt. Earlier, the EPA announced the resignation of Pruitt scheduler Millan Hupp, which came after lawmakers released her testimony to the congressional panel. Hupp said that Pruitt had directed her to house hunt and carry out other personal errands for him, including asking the Trump International Hotel about buying a used mattress cheap. Pruitt had been under fire for leasing a condo in Washington, D.C., that was tied to a fossil-fuels lobbyist. An EPA ethics official said the $50-a-night rental did not violate federal ethics rules, although that price appears to be be less than market rate and he was charged only for the nights he stayed in the unit. His daughter stayed in the second bedroom in the summer as well. 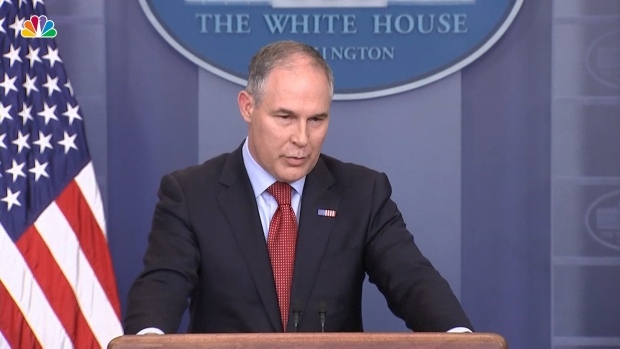 Environmental Protection Agency Administrator Scott Pruitt was asked multiple times Friday about President Donald Trump’s beliefs on climate change, which Trump has referred to as a “hoax.” Pruitt gave no direct answer. Later the ethics official, Kevin Minoli, said he had lacked key information when he made his evaluation. He looked only at the terms of the lease, which provided for one bedroom, and did not consider the value of the second bedroom. Pruitt has long been a champion of the oil and gas industry, and the arrangement — the home unit is owned by the wife of Steven Hart, a registered lobbyist whose firm pushed EPA to relax pollution regulations — raised questions about Pruitt's impartiality. A Republican who previously served as the state attorney general of Oklahoma, Pruitt moved to scrap, gut or replace numerous federal environmental regulations opposed by the industry while boosting the continued burning of fossil fuels, which is the primary cause of climate change. Earlier this year, The New York Times reported that the EPA approved a project from a company that Hart's firm represented, though both the EPA and the firm denied any connection to the condo rental. The same day, The Daily Beast reported that at least three members of Congress held fundraisers at the the townhouse where Pruitt stayed; the EPA said Pruitt wasn't invited to and didn't attend the events. Asked about those and other recent stories portraying Pruitt in a negative light, an EPA spokesman sent NBC News this statement: "From advocating to leave the Paris Accord, working to repeal Obama’s Clean Power Plan and WOTUS, and cleaning up toxic Superfund sites that have been languishing for decades, Administrator Pruitt is focused on advancing President Trump's agenda of regulatory certainty and environmental stewardship." Pruitt's personal security requests were under investigation as well. The EPA's inspector general revealed in May that Pruitt had requested and received 24-hour security beginning his first day in office, challenging Pruitt's own defense that the round-the-clock security was a result of threats against him after taking office. Many top positions in President Donald Trump’s Cabinet and the West Wing have been in flux. Pruitt's preoccupation with his safety came at a steep cost to taxpayers, as his swollen security detail blew through overtime budgets and at times diverted officers away from investigating environmental crimes, NBC News reported. Altogether, at that time the agency had spent about $3 million on Pruitt's 20-member full-time security detail, which is more than three times the size of his predecessor's part-time security contingent. One of the more outlandish of Pruitt's security requirements was the purchase of a $43,000 private office booth, which the Government Accountability Office found in violation of federal law. The agency failed to notify Congress in advance of an expenditure exceeding a $5,000 cap on spending for office renovations, the ruling said. In hearings with lawmakers, Pruitt repeatedly dodged directly answering whether he requested the stepped-up security coverage, saying career EPA officials below him made the final decision, NBC News reported. Pruitt had been critized for bypassing the White House to give two close aides raises, which together totalled more than $80,000. Because the aides were political appointees, the White House had to sign off on the increases but declined. The EPA then turned to a provision of the Safe Drinking Water that allows the administrator to hire people without approval and which was used in the past to hire specialists. After The Atlantic uncovered the raises, Pruitt blamed them on his staff and said they never should have been awarded. He had been under scrutiny for frequent taxpayer-funded travel, which has included first-class airline tickets. 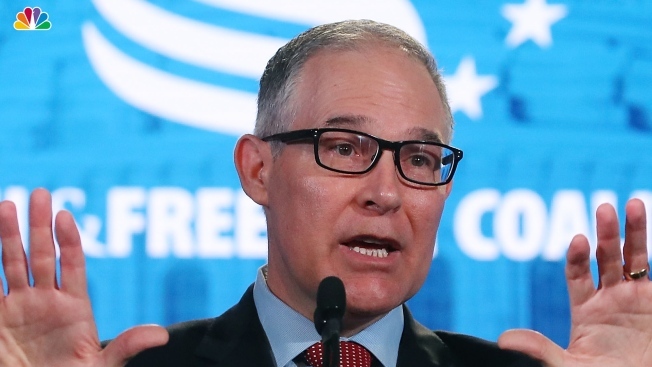 Though federal regulations typically require federal officials to fly in coach, the EPA chief said he needed to sit in premium seats due to security concerns. Pruitt's EPA travel had often included weekend-long layovers at his home in Tulsa. The EPA chief is widely mentioned in Oklahoma as a possible successor to Sen. James Inhofe, the state's octogenarian GOP senator who is expected to retire at the end of his current term. Scott Pruitt was confirmed and sworn-in as the newest EPA administrator on Friday, despite strong objections from environmentalists and conservation groups. The Senate voted 52-46 to confirm Pruitt. Pruitt is the latest top Trump administration official to resign or be fired. Secretary of Veterans Affairs Chief David Shulkin left at the end of March after he clashed with political appointees in his administration. Before him, national security adviser H.R. McMaster announced his resignation and Secretary of State Rex Tillerson was ousted. Pruitt's interim replacement is already the subject of an ethics complaint. Wheeler was among 30 federal employees who were allegedly working in violation of Trump's own executive order to keep the government free of former lobbyists, NBC News wrote. Bloomberg News had reported that he worked as a lobbyist for the coal industry as recently as May 2017. Wheeler never received a waiver from Trump's executive order, Public Citizen said.